There have been many recent news stories about preconstruction condos in Panama City Beach. While the condo market has made a nice recovery, it is a little premature to forecast another preconstruction boom. With recent articles like Officials say real estate is booming in Panama City Beach and PCB planning board approves resort project you could easily be forgiven for believing we are on the verge of another preconstruction boom. That is simply not the case. There are several apartment complexes under construction. Holliday Inn & Suites and Hampton Inn & Suites recently opened gulf front hotels. 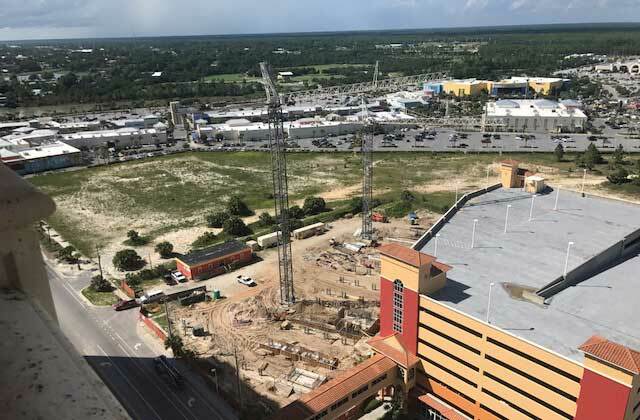 Cranes just went up to build a 200-room SpringHill Suites by Marriott. We have even a surge in gulf-view and gulf-view home construction. While this is part of a healthy real estate recovery in Panama City Beach, it is hardly the next condominium or real estate boom. Calypso did begin construction on Tower III this summer. They began construction without any preconstruction contracts. They canceled prior preconstruction reservations and are now taking new reservations. This condominium is unique in many ways. First, Calypso Tower III is not following the traditional preconstruction model (reservation, condo docs, hard contract, building construction, and then closing). Second, it is also built next to Pier Park. This allows it to command higher rental rates and sales prices. This condominium is asking $255 – $292 per square foot for gulf view condominiums. This resort project has recently been in the news as a resort project with a hotel, condominiums, cottages, a beach bar and restaurant. In the articles, the media failed to mention one key piece of information. 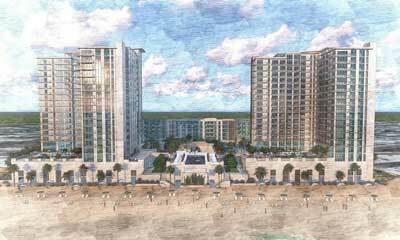 Only the hotel (phase 1) is scheduled to build out when the resort projects gets final approval from the Panama City Beach City council. The developer plans on waiting for the real estate market to support preconstruction condo and cottage prices (phase 2 and 3). December 2015 the news reported Movin on up: Panama City Beach clears way for new beach-side condo. We have yet to hear any further information on the 220-foot, clover-shaped condo building. The media is sugarcoating the Panama City Beach housing market. Many articles lead people to believe preconstruction condo sales are right around the corner. That is an exaggeration. Calypso and Aqua represent the high-end of the Panama City Beach condominium market. Floor plans are selling at $320 - $340 per square foot. Gulf front preconstruction becomes profitable for developers at $400 - $450 per square foot. It is way too early to release gulf-front preconstruction. Calypso west end three-bedroom has broken out this year. A number of things make this floor plan unique. The higher per square foot sales price reflects the balance between supply and demand for this unique floor plan. The small square footage for this three-bedroom floor plan is the largest contributing factor to this anomaly. Created on 19 September 2017 . Last updated on 27 September 2017 . Just looking at pcb/destin area for investment condo pre construction price to pay for itself. At least break even in expenses and rental revenue with low hoa fees.